It has been a very slow year photographically for me but finally, I managed to get out of my office and re-discover one of my long time neglected locations – the Cascades. I’ve been here a few times before but never on a dedicated trip and so I was very excited to be heading this way and hoped that I’ll be able to spend some time exploring the area. But as it often is in a photographer’s life, despite the weather promising a good opportunities, it turned its wet side on me and pushed me back home, way sooner then I expected. The first evening looked very bleak and uninteresting in the beginning but I went to my selected spot regardless, hoping that some abrupt cloud change would happen. I experienced this scenario countless times…after all, that’s what pursuing photographs is all about, playing a ball with the environment and either succeed or humbly accept the failure. 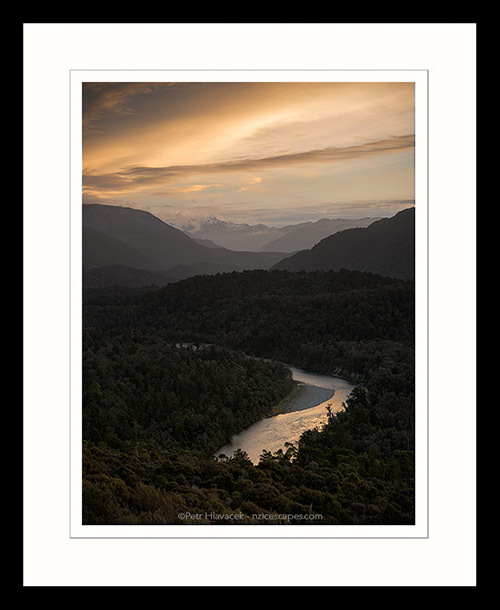 Being here a few times before, I saw this beautifully curving river into the great wilderness of the Red Hills and Olivine Ranges in South Westland and I thought, well, this would make a very beautiful photograph…the scene also looked somewhat familiar to me. I haven’t come across any other river like this, which would curve its way so poetically, so gently into the great unknown and back then I thought to myself, I need to return and try to make a nice photograph of this scene. …and so here I am, looking into the distance on the overcast evening, thinking to myself, what can I pull out of these conditions. With the weather like this though, you never know what can happen. Unfortunately, there was no drama in the clouds I hoped for, instead, very bleak, overcast skies. These overcast skies often block any colouring on the sky and the sunset just fade away without any colour at all. Sometimes, however, when there is a bit of a gap on the horizon, or weaker clouds, the sun rays may get through and paint some parts of the sky with a bit of a colour. And that’s exactly what happened to me here. The sun, for a brief moment, cast a soft orange hues to the sky but being diffused by the weaker clouds’ coverage, the orange hues spilled all over the scene as well, reflecting beautifully on the river below. When I started to process my files, I started to see the wonderful results in both, in colour, as well as in Black and White rendition of the image. 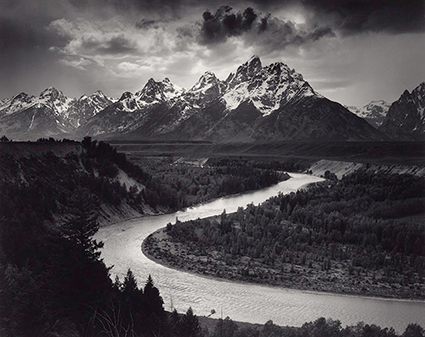 Staring at the B&W version of the image, suddenly, it dawned on me, that it reminded me principally one of the Ansel Adams photographs, Snake River he made 75 years ago. Please, don’t get me wrong here, I’m not comparing my image with Ansel Adams, instead, I’m trying to demonstrate how learning from masters we admire in our lives, can inspire and subconsciously help us to squeeze a better bits from ourselves. For more images from this part of West Coast please visit my stock gallery Cascades, South Westland. I know, it can be hard to leave warm parts of the world, especially northern hemisphere, to make a holiday trip to the opposite side of the globe to New Zealand, where winter is in a full swing. 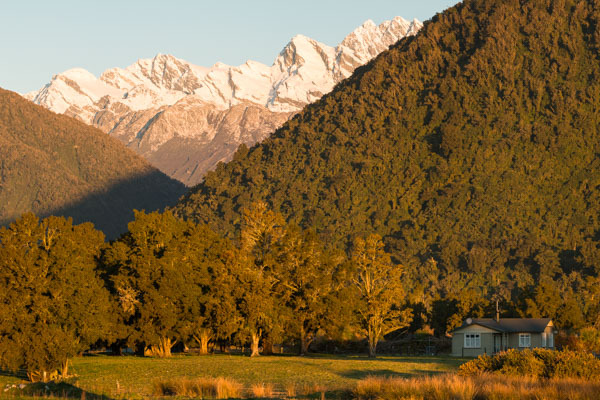 Of course, those skiing enthusiasts are always looking forward to this part of the year, anywhere, but apart of those snow lovers, it may take rather not so ordinary holiday folk, to visit New Zealand in winter. And I have to say, these guys know what they’re doing. The accommodation rates are much more budget friendly, roads are empty, in a cafe you get your coffee right away without queuing but most importantly, for us, photographers, the scenery doesn’t get any better than in winter time…on the West Coast in particular. All with comfortable hours for our sunrises and sunsets, as an extra bonus. 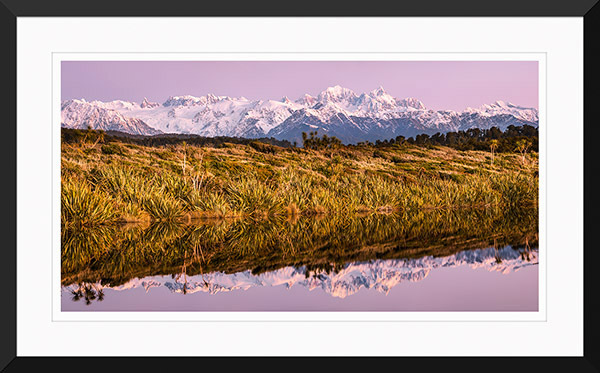 The long spine of the Southern Alps has a beautiful snow cover reaching into much lower altitudes then in summer and on the West Coast, these mountains are so close to you, that they’re in your viewfinder almost from everywhere. And that’s one of the reasons, why one of my photography tours is scheduled for this time of the year. Photographing on the West Coast in winter is spectacular with opportunities behind every corner, since those white mountains enhance the landscapes everywhere around us. This image was made just a few meters from my gallery in Whataroa during sunset and shows the farmland with native totara trees and white Southern Alps glowing in background. For more images from this part of West Coast please visit my stock gallery Westland Tai Poutini National Park. Can’t help myself not to make another post on wetlands in New Zealand. Our wetlands, on the West Coast of the South Island in particular, are very special not only for their support of hugely diverse range of birds species, many other animals and plants but simply because they’re just incredibly photogenic. This photograph demonstrates how important it is to know your location, to know what’s possible to occur. One of those occurrences in the case of this lagoon is, that it can get blocked after some severe storms. It stops it’s usual cycle of draining and filling up in accordance with the tide, and forms wonderful lake creating an opportunity for some beautiful reflections of the surrounding environment and nearby Southern Alps. Of course, one has to be patient or lucky to be at the spot on a calm evening like in this image and be aiming for the winter when the mountains put up its best display. I’ve been at this lagoon so many times but can only remember being there twice or three times over the years, when the lagoon was full and blocked like this. Remarkable fact is, that from lagoons in this area to the foothills of the Southern Alps, it can be as little as 10-15 km. These lagoons are also part of Westland Tai Poutini National Park – UNESCO World Heritage, and you can find more images from this location under the following link Westland Tai Poutini National Park. It’s strange, but for some reason, wetlands are rather forgotten places of a general interest, yet, they are the home to probably more creatures then any other environment. Sadly, over the centuries, the vast majority of these essential habitats in New Zealand have been drained in the sake of “human’s development”. Fortunately, a few of these wetlands manage to survive under protection of national park status, such as this, in the Westland Tai Poutini National Park. Photographing in these places is hugely rewarding, since wetlands offer endless opportunities for wonderful photographs to be made. This image has been photographed on an early morning, just when the sun appeared over the Southern Alps. 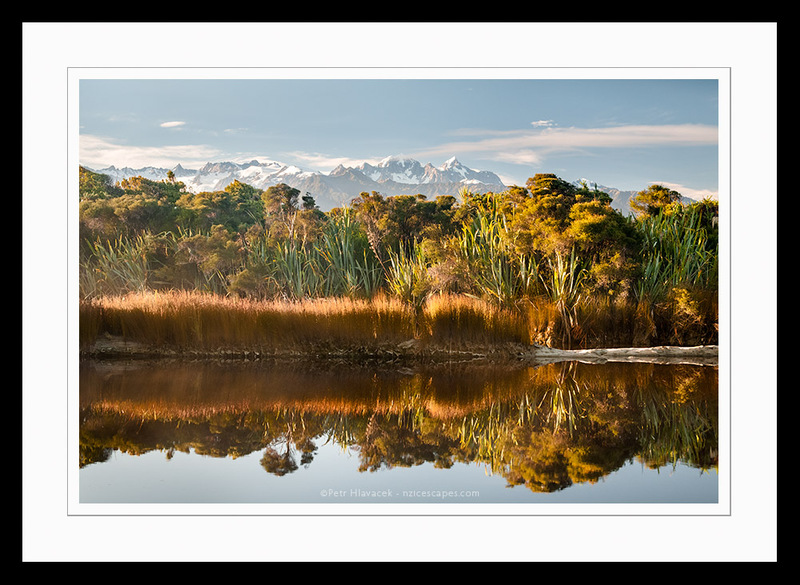 There was a morning mist over the lagoon of the wetland near Franz Josef Glacier, and as the sun climbed higher and higher on the sky, its morning light was defused by the mist and illuminated the scene with beautiful warm tones, lending the image wonderful airy mood. What a wonderful morning it was, with the Tasman Sea crashing behind my back and Mount Tasman, 3,497m, the second highest mountain of New Zealand on the horizon. For more images with similar theme, please visit COASTAL IMAGES. 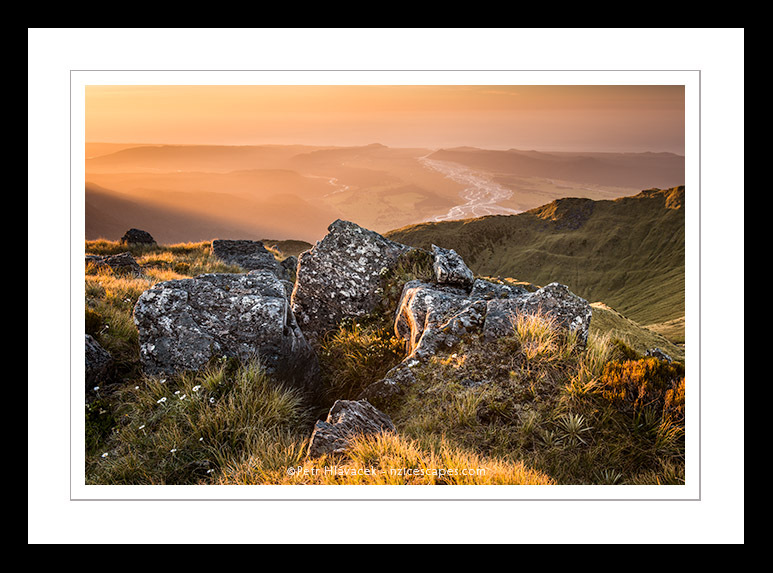 Continuing with the theme of “my golden 20 minutes”, this image was made not too far from Fox Glacier, high up in the alpine environment, when the end of the day light was dressing up the scene with a wonderful golden glow. This is one of my favourite locations where I love spending my time; exploring and amalgamating with the environment, looking and planning for new photographs. What’s remarkable about this alpine place is that the Tasman Sea, visible on horizon, is barely 10km away and you’re already around 1600m asl. I’ve been in this spot many times before, observing angles of the light, compositions, simply chasing photography opportunities. Among other images, I have always been attracted to the rock stacks scattered all around this alpine terrain, with these rocks in particular. They offer wonderful angle toward the sea on horizon, while incorporating the Cook River draining the Fox Glacier into the sea. All I needed was to be there in right time, when the setting sun was at the right angle and a suitable amount of clouds, or, rather lack of it, enabled the light to cast its wonderful warm hues across the landscape. For more images with alpine theme, please visit ALPINE IMAGES.